At AutoMAXX Pre-Owned Super Center our commitment is providing you, our customer, with a car buying experience that is second to none. Our entire staff will ensure that your experience with us is an enjoyable one. We will answer all your questions and concerns with honesty, integrity and respect so you can make an accurate, informed decision. Our goal is to be your premiere pre-owned destination." Our location is steeped in history. For over 50 years, thousands of Windsor and Essex County residents have purchased pre-owned vehicles at this landmark location. We are proud to continue building on this successful tradition with AutoMAXX Pre-Owned Super Center. Under the ownership of Chris & Doris Taylor, we provide a car buying experience unlike any other. Find the pre-owned car or truck you've been searching for on our lot or in our extensive online inventory of pre-owned vehicles. 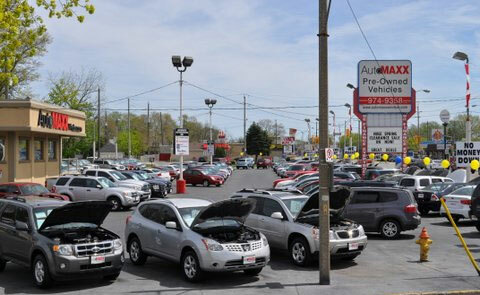 Great selection, fair prices and fully certified cars and trucks. AutoMAXX offers same-day delivery and a fast, convenient online credit application. A 90 day warranty is also included with each AutoMAXX pre-owned vehicle. Don't see the car you're looking for? Let us find your dream car for you! We have access to thousands of vehicles. Whether you are looking for a preowned or used car, truck, van or SUV in Ontario, we can find it for you. AutoMAXX has a buyer on-site at auctions throughout Ontario each weekday. We understand your time is valuable, if you would like one of our AutoMAXX pre-owned specialists to contact you at a specified time just send us an email at info@automaxxwindsor.com or click on our Meet The Team link for individual email addresses and we will be happy to assist you. Thank you for visiting AutoMAXXwindsor.com. You are very important to us and we appreciate you taking the time to stop by. We take great pride in our business and we are confident you will notice the AutoMAXX difference!